"Food service professionals -- restaurateurs, service staff, and caterers -- will find the book an indispensable guide to the correct way to set a table and present food, but anyone who has a need or yearning to know the nitty-gritty of table setting, table manners, and tableware will be sure to find answers to all of their questions and more in this exhaustive reference book." "The Art of the Table is thorough enough for a hospitality management course yet user-friendly enough for a total novice host or hostess. Anyone who is uncertain about how or when any given food or drink should be served, or the proper etiquette to follow at a formal dinner, is bound to find the answer here, making it a very handy reference in any home." "We all eat, but not all of us are informed about the customs we follow and the artistry involved in the simplest table service. I highly recommend this book [The Art of the Table] to anyone interested in the history or practice of this succulent art. " "The Art of the Table offers a unique look at dining today as well as dining in the past. With its equal blend of history and present day dining, there is something for everyone waiting inside the pages." "A phenomenal resource book dedicated to enlighten and inform its reader. The Art of The Table - A Complete Guide to Table Setting, Table Manners, and Tableware, is extremely thorough in covering all the details related to proper table etiquette. Author Suzanne Von Drachenfels makes it so easy, and entertaining in the process, finding the answer to any mealtime dilemma. In nine, worldly-wise written chapters, you will learn all about table fundamentals. Starting with the dining experience (formal vs. informal), then dinnerware, flatware, stemware, table linens, serving techniques, dining finesse, menu planning, Suzanne completes her mission with her undertaking of table manners in a changing world. Her history lessons compliment any given subject and are very enjoyable. Excellent!" "The Art of the Table is much more than simply helpful and informative. The author includes a fascinating history of eating utensils, serving ware, glassware, tea, wine, and coffee. And in the center of the book are full color pictures of both formal and informal table settings. In essence, this book is like the dining experience von Drachenfels extols -- a memorable experience. It would be the ideal gift for brides, and is a must have for anyone wishing to learn more about The Art of the Table." "You may not sit down to read the 550 pages of The Art of the Table on a quiet evening. But this book is one you should have at hand near your kitchen or dining room. You'll find out everything you ever could conceive you'd need to know about setting a table." 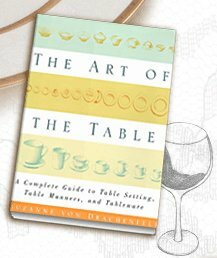 "From Dining Fundamentals to Dinnerware, Flatware to Stemware, Table Linens to Serving Techniques, Dining Finesse to Menu Plan and finally Table Manners, von Drachenfels covers all topics needed to give the ultimate dinner party with grace and finesse. This book is a treasure trove that any hostess would cherish. Before your next big extravaganza or your little informal tea, make The Art of the Table yours." "Certainly this is a reference book to be sourced time and again. Yet it reads far more fluidly, far more conversationally, than most reference books. Ms. von Drachenfels has a light touch with words that elevates this work far above the average recitation of dining facts. The reader is led through each subject by a deft hand that explains the where-fors and whys of dining actions and objects. She makes the study of dining so much fun that the eye is often pulled into reading far more than the original item referenced. " "This is a book that should be on every cookbook shelf, but more, in every library and, yes, on the history book shelf, too. Every host or hostess who wants to impress his or her guests will want to get hold of this volume. If you enjoy thumbing through gourmet or cooking magazines, you will thoroughly enjoy "The Art of the Table"! " "When your boss is coming to dinner and you can't tell your dessert spoon from your demitasse spoon and you're wondering if you actually have a five o'clock spoon, turn to The Art of the Table for all the answers on the finer points of dining and tableware." "A great experience awaits in reading The Art of the Table. I highly recommend it." --Bert P. Cutino, cofounder of the Sardine Factory Restaurant and Monterey chapter president of the Confrérie de la Chaîne des Rôtisseurs, the world's oldest gastronomic association.